Synopsis (from Indiebound): Obe Devlin has problems. His family's farmland has been taken over by developers. His best friend Tommy abandoned him for the development kids. And he keeps getting nosebleeds, because of that thing he doesn't like to talk about. So Obe hangs out at the creek by his home, in the last wild patch left, picking up trash and looking for animal tracks. One day, he sees a creature that looks kind of like a large dog. And as he watches it, he realizes it eats plastic. Only plastic. Water bottles, shopping bags... No one has seen a creature like this before, because there's never been a creature like this before. The animal--Marvin Gardens--becomes Obe's best friend and biggest secret. But to keep him safe from the developers and Tommy and his friends, Obe must make a decision that might change everything. Why I recommend it: I've read every weird and amazing YA novel A.S. King has written. So I was thrilled when I learned A.S. King (also known as Amy Sarig King) had finally written a novel for the middle grade reader. And what an extraordinary novel it is. The writing is spare and the voice is spot-on. I love the way each Obe-centered chapter begins. (Examples -- Chapter 1: "There were mosquitoes." Chapter 3:"There was a mess." Chapter 9: "There were questions.") Interspersed with Obe's short present-day chapters are even shorter chapters titled "One Hundred Years Ago", where we learn more about Obe's ancestors and how the Devlin land was lost. Obe is a likable character, filled with righteous anger over the development of his family's land. 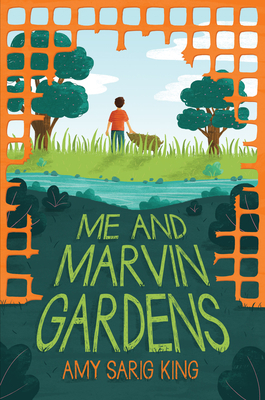 Marvin Gardens is undoubtedly the most unusual animal you'll ever encounter in MG fiction. And in case you're wondering -- yes, Obe names him for the Monopoly property. In fact, Monopoly plays an important part, and small illustrations of vintage Monopoly pieces decorate the beginning of each chapter. If you've ever played Monopoly, you know it's a ruthless game of acquiring properties and building on them. It's easy to guess that Amy King hates the way developments have taken over once-beautiful and once-productive farmland, not just her own family's land in Pennsylvania (see the About the Author page) but all over our country. And she must feel the same way I do about global warming and pollution. This book is the perfect read for "Earth Month" -- which Obe's favorite teacher insists we should have instead of just one day. Bonus: Besides the environment (certainly a timely and important theme), this book explores bullying, friendship, and family relationships. Sorry for my absence but I've been dealing with family issues and health issues, as well as working on revisions for the Advanced Novels in Verse workshop I'll be attending at Highlights in June. Welcome to another Diversity Monday. It's also Poetry Month, so I'm celebrating both at once with this lovely book. Thanks to a librarian friend from the 2016 Novels in Verse Workshop for introducing me to this one. Synopsis (from Indiebound): Keet knows the only good thing about moving away from her Alabama home is that she'll live near her beloved grandfather. When Keet starts school, it's even worse than she expected, as the kids tease her about her southern accent. Now Keet, who can "talk the whiskers off a catfish," doesn't want to open her mouth. Slowly, though, while fishing with her grandfather, she learns the art of listening. Gradually, she makes her first new friend. But just as she's beginning to settle in, her grandfather has a stroke, and even though he's still nearby, he suddenly feels ever-so-far-away. Keet is determined to reel him back to her by telling him stories; in the process she finds her voice and her grandfather again. 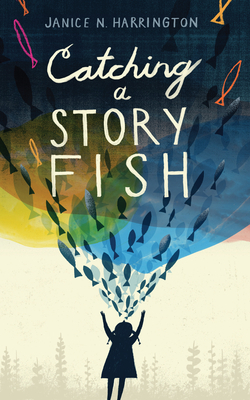 This lyrical and deeply emotional novel-in-verse celebrates the power of story and of finding one's individual voice. Why I recommend it: This is gorgeous. A warm and moving celebration of poetry, words, and voice. There's a compelling story here, told with plenty of humor and compassion, as Keet adjusts to her new life. But the book is also a word-feast, using many different forms of poetry. Concrete poetry, haiku, haibun, narrative poems, and even the difficult-to-write forms of pantoum (repeats the second and fourth line of each quatrain as the first and third line of the next) and contrapuntal, which can be read in three ways (the left column one poem, the right column another poem and when read together, left to right, there's a third poem!). A poetry glossary at the back explains it all. so wherever we look, he says, "Shhhhh. Shhhh. The fish will hear you." Bonus: Perfect for classroom lessons on different forms of poetry.